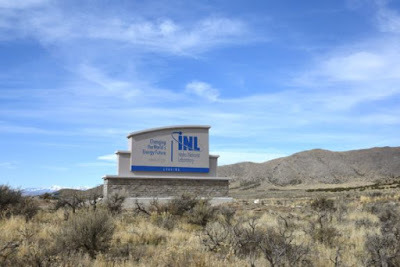 One of the new INL signs on U.S. Highway 20, in the Arco Desert. If you've gone west on U.S. 20 recently, it's pretty hard not to notice that the Idaho National Laboratory desert site entrance signs -- billboards for decades -- have been upgraded to a much classier presentation. At both ends of the site on the Arco Highway, INL Facilities & Site Services have erected large monument signs on concrete bases with rock faces at the bottom. Not only do the entrance signs help demarcate federal property boundaries, they serve as an important branding and advertising tool. INL Director Mark Peters was a driving force behind replacing the varying and inconsistent previous signage. Debby Tate, Campus Development Office (CDO) director, said, “The new signs provide a sense of maturation and elegance to INL.” Remaining boundary, or “billboard,” signs on roadways at other Site entrances are scheduled for replacement in the coming months. The new signs, which had been in the planning stage for several years until funds became available, were designed by INL’s very own David Combs, INL art director and branding specialist, and constructed by YESCO Sign & Lighting Service of Idaho Falls. “The vision for the monument signs was to create markers that not only showed the geographic boundaries, but that had significant impact and the gravity appropriate for an institution like our national laboratory,” Combs said. INL dates back to 1949, when the Atomic Energy Commission selected the area that encompassed the old Naval Proving Ground and surrounding lands to build the National Reactor Testing Station (NRTS), whose mission was to develop and demonstrate peaceful uses of nuclear power. The name of the facility changed over the years: in 1974, it was named the Idaho National Engineering Laboratory (INEL) to encompass broader research missions; in 1997, it became the Idaho National Engineering and Environmental Laboratory (INEEL) to reflect growing cleanup and waste management missions and research; in 2005, the INEEL became Idaho National Laboratory, which is under the DOE Office of Nuclear Energy. As names such as these have changed, INL entrance signs have reflected those changes over the decades. Massive post. Really good-looking blog. A cluster of blogs, I watch these days don't really present anything that I'm interested in. but I'm most absolutely interest in this one. I am in really happy with article value and route. This post is mark on in helpful how some thought apply to any script point. Thanks a lot for protection enormous things. I am extremely a good deal appreciative used designed for this place. Custom essay writers visit this site for the writing ideas and help!